This powerful blend of amino acids, vitamins and minerals offers extra liver support for people who regularly drink alcohol, smoke or have taken recreational drugs. Choline and Alpha Lipoic acid support liver function. 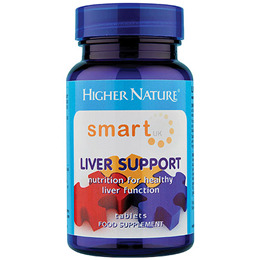 Powerful antioxidants, Zinc and Alpha Lipoic acid protect the liver from free radical damage. This product has been formulated in conjunction with SMART UK who work with the NHS, HM Prison Service and HM Armed Forces amongst others. Ideally take together with SMART UK Brain Complex. CONTAINS NO added salt, starch, wheat, gluten, yeast, lactose, dairy products, artificial preservatives, colours or flavourings. Choline bitartrate, n-acetyl l-cysteine, l-methionine, l-taurine, cellulose, vitamin C (ascorbic acid), alpha lipoic acid, l-glutamine, natural vitamin E (as d-alpha tocopheryl succinate), zinc citrate, calcium d-pantothenate, thiamin HCl, niacin (as nicotinamide), riboflavin, flow agent: magnesium stearate (vegetarian source), anti-caking agent: silicone dioxide; pyridoxal-5-phosphate, pyridoxal HCl, inositol, zein protein coating, folic acid (as pteroyl glutamic acid), methylcobalamin. Adults: Take 2 tablets a day, with or between meals. Below are reviews of Smart UK Liver Support - 90 Tablets by bodykind customers. If you have tried this product we'd love to hear what you think so please leave a review.